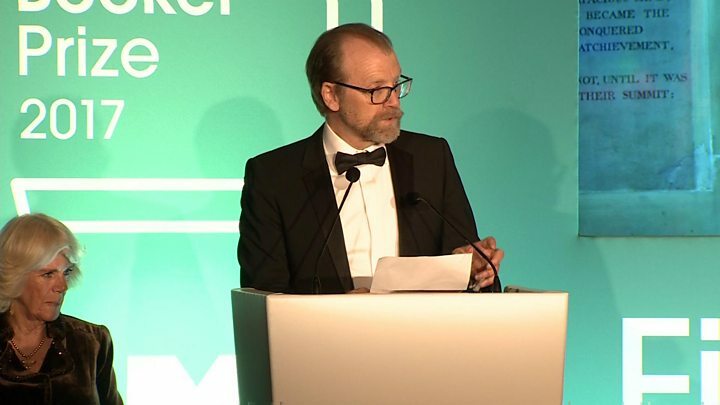 George Saunders has won the Man Booker prize for his novel Lincoln in the Bardo - becoming the second US author to take home the £50,000 fiction award. The book tells the story of Abraham Lincoln's grief after the death of his young son, and his visits to his tomb. It is the first full-length novel from Saunders, previously best known for his short stories, and is set in a graveyard, over a single night. Judges praised the "utterly original" work and said it was "deeply moving". Saunders said he had "carried the idea [for the novel] around for 20 years", adding: "I really didn't want to write about Lincoln but was so captivated by this story." This is initially a rather off-putting book - it's got a rather strange title and when you read the first few pages, you don't really know what's going on. It's the most experimental of the shortlisted novels, told in a multiplicity of voices. It's almost like a verbal collage. It can be quite a disconnecting experience, but stick with it because it is not only very moving, but it's also very funny. Lincoln in the Bardo is a very interesting exploration of one of America's great presidents. It's examining his private rather than public role. 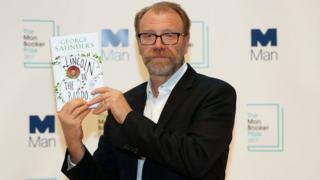 Because it's dealing with his dead son, it could risk becoming sentimental, but George Saunders manages to avoid that. One thing I can promise you is that you've never read a book like it. It is completely original. Saunders, 58, was one of six authors shortlisted for the prestigious award, alongside British writers Ali Smith and Fiona Mozley, fellow Americans Paul Auster and Emily Fridlund, and British-Pakistani author Mohsin Hamid. Speaking after his name was announced, Saunders said: "Thank you for this great honour which I hope to live up to with the rest of my work, for the rest of my life." The Texas-born author, who lives in New York, has previously won the Folio Prize and Story Prize for his short story collection Tenth of December. Lincoln in the Bardo is his ninth book, and had been the favourite to win the Booker. The Duchess of Cornwall presented his trophy at London's Guildhall. He based the story on a real moment in 1862 when the body of the US president's 11-year-old son Willie was taken to a cemetery in Washington DC. Saunders revealed after writing the first third of the book he "got a bit freaked out" and wasn't sure "if any other human being could read it". His wife Paula then read it and wrote on a post-it note "something so generous it will stay a secret forever" and that gave him the confidence to continue. During a post-ceremony press conference, he said: "It sounds a little pathetic but for an artist I think validation is really helpful. Maybe you shouldn't need it but I definitely do. "So when someone that I respect approves my work or when I get grouped with a bunch of writers like these wonderful talents, my opinion of myself improves a little bit and the next book has a little more courage in it." Saunders said the novel had been in his heart for 20 years before he wrote it. Asked why it took him so long to commit it to the page, he told the BBC: "My stories are a little dark and cynical and sci-fi, and I just couldn't see any way to approach this serious material. "I tried a couple of times and it didn't work, and I just thought: 'Either don't do it, or wait until you've enough life to do it justice'." Baroness Lola Young, chair of the 2017 judging panel, said the form of the novel - which includes voices of 166 souls in the graveyard - "reveals a witty, intelligent and deeply moving narrative". It took five hours of deliberations before the panel, also including novelist Sarah Hall, artist Tom Phillips, literary critic Lila Azam Zanganeh and the travel writer Colin Thubron, made their unanimous decision. Baroness Young described the responsibility of choosing a winner as "draining", saying: "We had actually some tears - but that was as much due to the kind of relief of having gotten to the decision, it wasn't about anger or sadness or whatever." She added: "This really stood out because of its innovation - its very different styling and the way in which it paradoxically brought to life these not-quite-dead souls in this other world. "There was this juxtaposition of the very personal tragedy of Abraham Lincoln with his public life, as the person who'd really instigated the American Civil War." The shortlist was whittled down from a longlist of 13 novels that was announced in July. The award has been open to US writers since 2014 and was awarded to its first American winner, Paul Beatty, last year. Lincoln in the Bardo is published by Bloomsbury, making this the third consecutive year an independent publisher has won the award. The bardo in the book's title refers to the transitional state between death and your next birth, according to Tibetan Buddhism. Man Booker prize - Who's won it before? As well as the winner's cheque, Saunders receives a rather unique honour - Royal Mail will apply a congratulatory postmark bearing his name to millions of items of stamped mail on Wednesday and Friday. It will read: "Congratulations to George Saunders, winner of the 2017 Man Booker Prize." He can also expect a spike in sales. In the week after Beatty won last year, sales of The Sellout increased by 658%. Saunders teaches at Syracuse University and was named one of the 100 most influential people in the world by Time magazine in 2013. In a nutshell: A young man growing up in New Jersey in the 1950s and 60s leads four parallel lives. Judges' comment: "An ambitious, complex, epic narrative... that is essentially both human and humane." In a nutshell: A 14-year-old girl living on a commune in the US Midwest befriends some new arrivals. Judges' comment: "A novel of silver prose and disquieting power that asks very difficult questions." In a nutshell: A boy and girl fall in love, move in together and consider leaving their unnamed country. Judges' comment: "A subtle, compact piece of writing about a relationship, its blossoming and digressions." In a nutshell: A boy remembers his life in a house his father built with his bare hands in an isolated wood. Judges' comment: "Timeless in its epic mixture of violence and love, it is also timely... with no punches pulled." In a nutshell: President Abraham Lincoln goes to a Georgetown cemetery to grieve following his young son's death. Judges' comment: "Daring and accomplished, this is a novel with a rare capaciousness of mind and heart." In a nutshell: A dying 101-year-old man is watched over by his closest and only friend. Judges' comment: "An elegy for lost time, squandered beauty but also for the loss of connections."